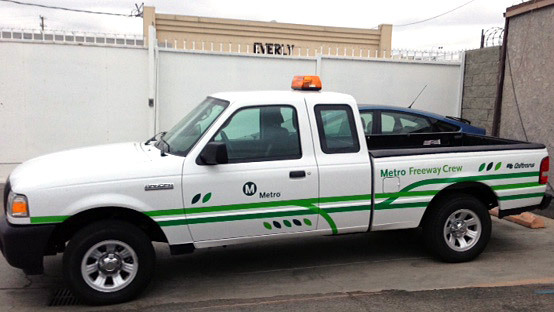 You might see one of these Metro Freeway Crew trucks on the freeways. Metro Freeway Crew, a pilot project dedicated toward mitigating graffiti, removing debris and enhancing the landscape on the I-110 and I-710 freeways, officially launched this week. Intended to augment Caltrans efforts along the corridors, the Metro Freeway Crew is focusing on areas of the I-110 between Hill Street and Exposition Boulevard and the I-710 between SR-60 and I-405. Work has already begun. More than 250 graffiti tags and acts of vandalism have been removed and as of October 2012, Metro Freeway Crew has cleared 5,500 pounds of trash and debris from the freeways. Additional highway cleanup, irrigation repair and landscaping preparation will take place in the coming months. Promotional bus posters, rail cards and pamphlets to alert the public to the presence of the Metro Freeway Crew will be strategically placed throughout the Metro system. Drivers should be careful of crews working along the corridor and slow when passing work crews on the freeway. The Metro Freeway Crew also will be partnering with Caltrans to work with the Los Angeles Unified School District in educating students on graffiti abatement efforts and the importance of keeping public areas clean. A class will be chosen to receive drought-tolerant plants to nurture until the plants are ready for relocation to an area slotted for landscaping, scheduled to begin Spring 2013. Check out some before and after pictures after the jump. The after pics are renderings as landscaping does not begin until next spring. Utility relocation to begin in November for Regional Connector! Agreed D. Though quite frankly, most of this city looks like s*** with all the tagging and litter and old furniture everywhere. There are so many trashy people here. I’d like to see a huge public service campaign informing people that the street is not their personal junk yard. People throw litter because “I’m creating jobs for janitors” and “I pay for taxes, therefore I’m entitled to litter” idea plagues everybody. You see this everywhere from ball parks to the streets.